I saw this whimsical idea here and just had to share it with you because it’s really brilliant. 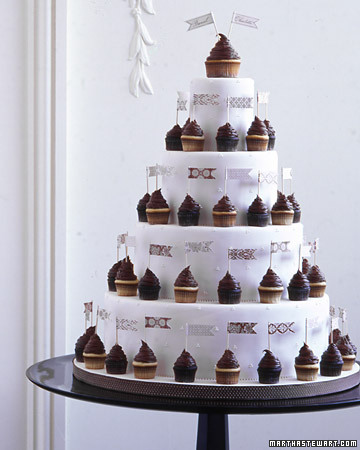 You can still have a somewhat traditional wedding cake, complete with several tiers of your favorite cupcake flavors. But instead of embellishing the cake with flowers or candy or fondant creations you decorate each tier with cupcakes. A really fun idea might be to give the groom the choice of flavor for the cupcakes and then the cupcakes could stand in for his groom’s cake. You could do something as simple as chocolate and vanilla or something more exotic. And the mini flags featuring the newlyweds’ initials are a nice touch. This is such a fun idea – I’d love to see more cake and cupcake duos at wedding receptions this year!